Today the avalanche danger is mostly LOW with potential for pockets of MODERATE danger in the alpine, above 2500’. Small shallow wind slabs 4-8” are possible on steep leeward features along ridgetops, as well as soft storm slabs up to 4” thick at mid elevations. The avalanche danger below 2500’ will remain LOW today. Caution is advised below 1500' where a very thin layer of snow is coveraging rocks, ice, and roots. Tonight the APU Outdoor Studies Department and Alaska Avalanche School present Winter Wildlands Alliance’s Backcountry Film Festival!! This is an AAS and F-CNFAIC fundraiser - a great way to support local avalanche education and information. Hope to see you there! Today is all about what the weather might do. Snow has been the talk of Southcentral Alaska over the last few days, but unfortunately Girdwood and Turnagain have only received a trace of new snow. It looks like today might be more of the same as most of the precipitation tracks up Cook Inlet. There remains a chance of snow (2-4”) at higher elevations and freezing rain at sea level. Rain/snow line could be as high as 1000’ today. Ridgetop winds are expected to be moderate (15-25mph) from the Northeast, just enough to form small isolated wind slabs on leeward features in the alpine. Currently 2-6” of low-density snow is available for transport, and if we see up to 4” of new snow, small shallow slabs (4-8”) are possible on steep leeward features at higher elevations. Heighten awareness is advised in steep terrain where smooth pillow-like windslabs could be lurking. Pay attention to how the snow changes throughout the day and be on the lookout for small isolated soft slabs on steep features at mid elevations. We currently have a weak interface where 2-4” of poorly bonded old snow is sitting on a melt/freeze crust. Today temperatures will be in the high 20’sF to low 30’sF at mid elevations (2500-3000',) and if we see snow today soft storm slabs (4” deep) are possible. Luckily this is a low consequence hazard, but still warrants caution on large steep terrain features above 35°. Early seaon hazards do exist at lower elevations where rocks, branches, and frozen ice are barely covered by a trace of new snow and surface hoar at elevations below 1500'. Use caution today at this elevation band where these harzards may become less visible if we do recieve more snow. Photo taken Jan.22, 2015 at 1200' on the East side of Seattle Ridge uptrack. Today a low-pressure system has positioned itself nicely to deliver snow to Western Kenai Peninsula and the Matanuska Valley. Above 1000’ Girdwood and Turnagain Pass may see 2-4” of snow today. Ridgetop winds will be moderate from the Northeast 15-25mph. Temps are expected to climb into the low 30’sF with rain/snowline around 1000’. A freezing rain advisory has been issued for roadways along Turnagain Arm until 3pm. 3-5” of snow is forecasted for this evening with an additional 2” overnight. Winds look like they will be light to moderate (10-20mph) from the Northeast. Temperatures are expected to cool slightly (mid to high 20’sF) increasing the potential for snow at sea level. 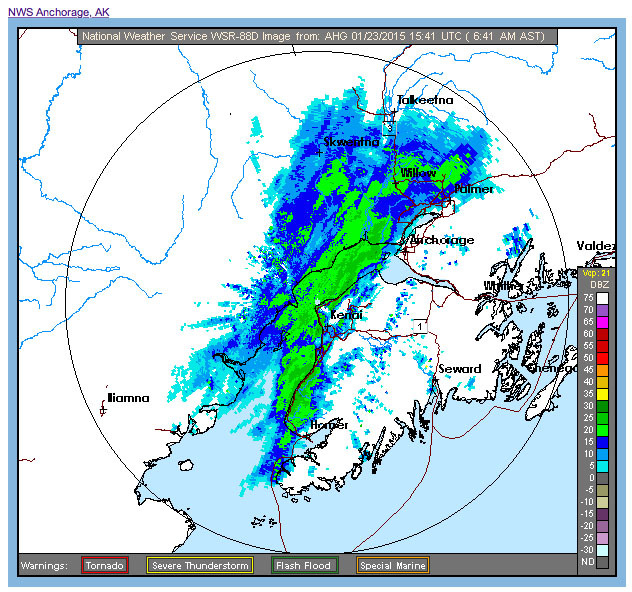 *Image below is screenshot at 6:41am of the the current snow storm tracking up Cook Inlet - not currently looking good for precip in Girdwood/Turnagain area.